This is something I don't know enough about yet. I use a breadmaker which some people hate, but it suits us for now. 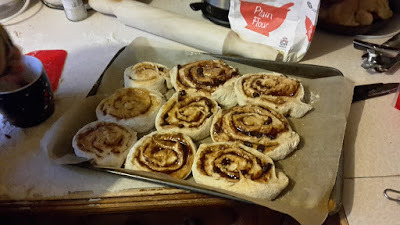 Occasionally I just use if for dough and finish the rest by hand (hardly something I can take much credit for, but still) and we also use it to make pizza dough. 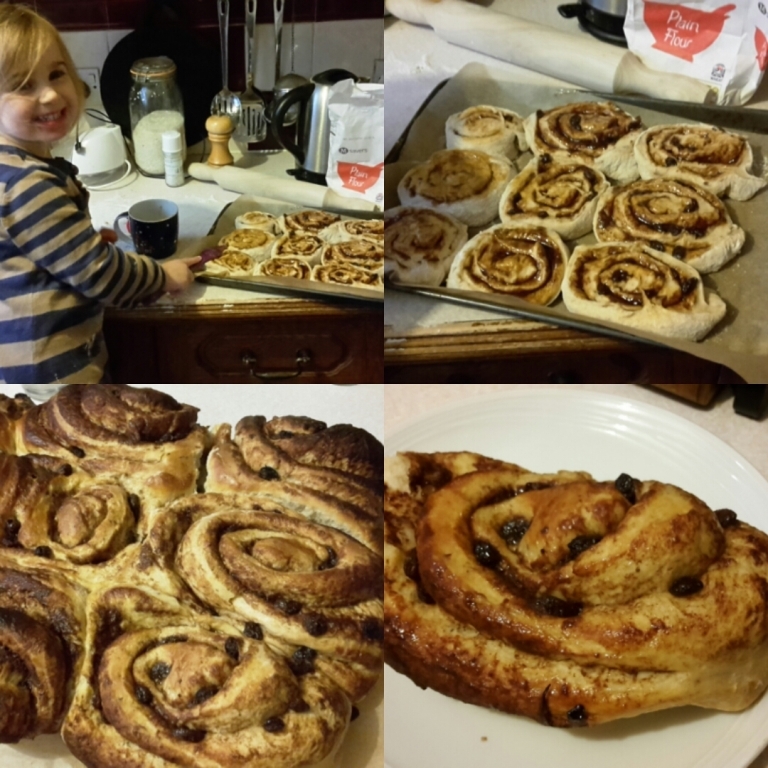 My kids put the ingredients in and 45 mins later get to roll their bases and leave to prove then top and bake. Then enjoy it and I know there's no additive in it so all is well. I have made speciality bread when we did a big spread for over 100 people in June. The Apple and cider bread went first, then pine nut and pesto and then sun dried tomato. I didn't get to taste one haha! But I'd like to have the knowledge in my head of knocking up something without having to read the ingredients. These Chelsea buns look enjoyable though and we may have a go over the Christmas (December) period. Dark nights, rubbish weather and short days warrant lots of this type of food I think. I especially love cooking with kid/s on this post. I always say "we're busy making memories" if someone asks what we're doing. My little girl, pictured above, always wants to press the button and get the flour out of the tub. You don't have to guess she's been there! i think that using a bread maker and finishing it by hand isn't cheating, you know what goes into it, you're also most aware of the most important bit of bread making, which is the timing. Cooking for 100 would be well above me! I can cook for five comfortably! I agree on the bread maker. ha the 100 was our moving in party and it was outside as a bbq was the main focus. I have to say i actually really enjoyed it. once in a blue moon is probably enough though. I love baking bread, I like making cinnamon rolls. 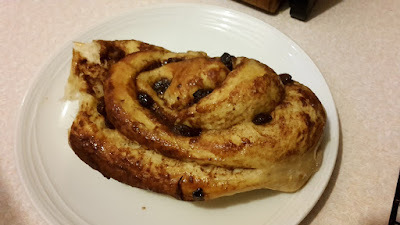 Yeah, I'll be making these again! I do enjoy a bit of baking through the week. I make dough for pizzas mostly these days. I went through a spell of baking sourdough bread, but the novelty wore off and I kept forgetting to feed, or discard, some of the starter. 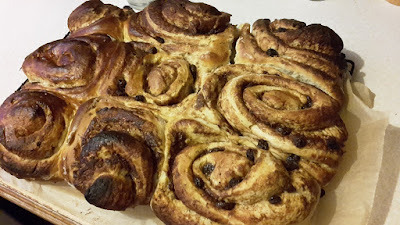 Your Chelsea buns look delicious, so I might have a go at them this weekend. That's when we tend indulge in treats! I had a spell of making sour dough as well. It tasted amazing but I was terrible at keeping it alive! Sue G on here was going to freeze hers and see if it survived. Just pizza crusts. Naan. I guess that's a bread too but I cook it in a cast iron pan. I'm sure my husband wound be very happy if I mastered some sweets like this. A good pizza is hard to beat. Did you see the posts on my brothers pizza oven he built? 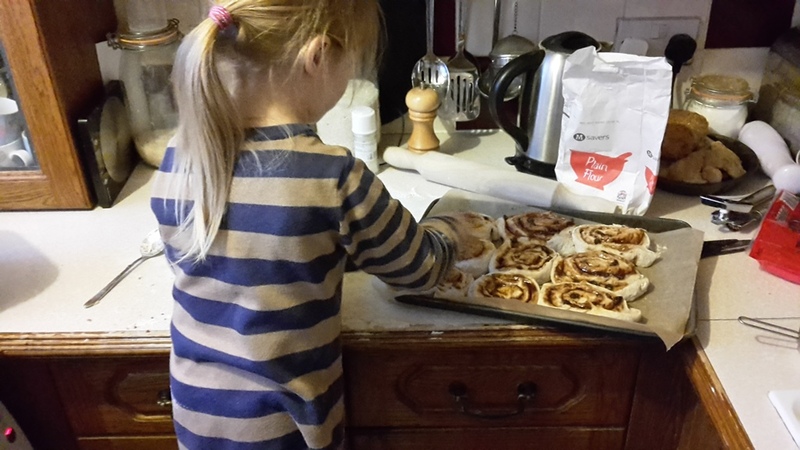 I've got to give this one a go, our little wildlings love baking as much as they love eating! Anything with a bit of rolling out gets them involved. I struggled to stop them eating these! I put the rinds of lemon lime orange and grapefruit in the freezer. When I have enough to make the effort worthwhile I turn them into candied peel. If I don't manage to completely dry them after I stick them back into the freezer -chopped. When I next make a sweet dough I add the candied peel for delicious fruit bread or use for tutti fruity ice cream. That sounds amazing, I've never made candied peal. I've been drying mine to use as firelighters! Yours sounds so much more tasty!